On my first trip to the post office when I arrived in St. James City, Florida, there was an interesting sign as I drove into the parking lot. You can see it in the picture above. 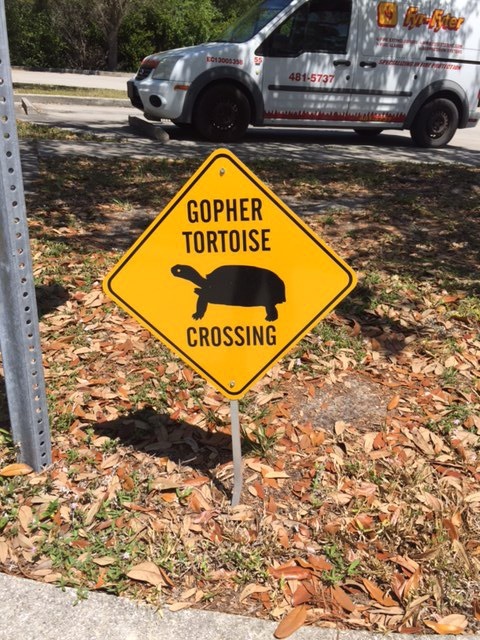 A sign warning of a Gopher Tortoise Crossing. Since I’m from Kentucky, I had never heard of a Gopher Tortoise. Silly me. It seems this little reptile is quite important in our ecosystem and it is endangered. The driveway into the post office is, indeed, a spot where they cross. 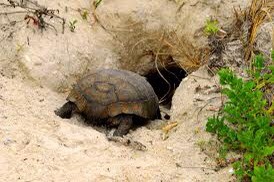 Most Gopher Tortoises live along the Florida Gulf Coast. They aren’t large, only about a foot in length and 10 pounds or so. They live 60 years if they don’t get run over on the highway or eaten by your pet dog. They don’t live in water as most tortoises do. Instead, they dig deep burrows in sandy soil, sometimes as long as 40 feet, in which they live and lay their eggs. They also host up to 360 other species of animals that otherwise would not have shelter. As with every species, they all have a purpose. Gopher tortoises mate between April and June and are out and about more during that time. If you see something that looks like a turtle on the highway, please dodge it. They are an important part of our environment.